Artful Affirmations: Time to say Hello! Yay Welcome back! I am thrilled to see a post from you and have missed your presence in bloglandia very much! HUgs and Blessings my dear friend! Wow..so mnany gorgeous creations..love those little houses..and your beautiful painting . And I adore your charming puppies and that stunning blanket.so pretty! Shine on and keep creating and sharing..it is wonderful to see you magical world again! Wishing you magic and joy always! Hi Terri, welcome back. I love that blanket you made and its beautiful colors. That tree lot house is cute and a clever idea. Give your sweet doggies a hug from me, your blog friend. Is that YOU????!!!!! Welcome back. I hope all is well now. So good to "see" you. You have been missed. Oh Terri! It's so good to read your new post. I feel like I've just heard from an old friend. I'm glad you're back, and I love all the creative projects you showed on this post, especially the Glitter House Tree Lot sneak peak. I'm so looking forward to seeing more of your creative, always peaceful and joyful, art. Hugs to you and those two adorable pups! Hello Terri! I have thought about you so many times during the year. I didn't know what had happened, but I sure am glad to see you back here! 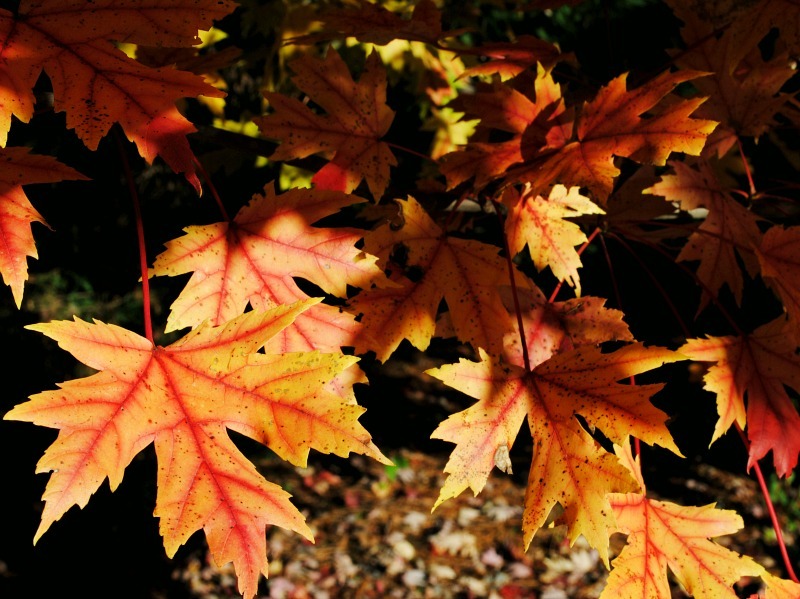 I hope all is well now and I wish you a very Happy Autumn and a very Happy Thanksgiving!! I may have to make a new domino book now!! OMG finally. I am so glad to see you back, Terri. I have missed your posts! It is really wonderful to see your beautiful art work again! WooHoooooooo! I'm so glad you're back! And you start off with gorgeousness as usual! I love the blanket. How beautiful it looks just draped over the chair. Those puppies of yours are so cute. Reminds me that Miss Lizzie should have the same kind of hair cut done. I love the glitter tree lot house. What a super idea! Congrats on the painting. It looks awesome! I'm so thrilled you're back! It is good that your creativity continued even when not blogging. I hope your difficulties have passed and you will feel more creative spirit. Ooh Terri how nice to see you again in Blog land! I am so happy. thank you for visiting me. The blanket looks nice and warm and so does your little house! And your painting! !! You are so gifted! I understand why you love Thanksgiving. I think it is good to be thankful. Big big hugs! How wonderful to see a post from you Terri it really made me smile. I am so happy to find you back here! You have indeed been missed, my friend. I have often thought of you and your son and also prayed for you both. I am happy for you that you are able to take art classes. I used to draw and paint myself as my family is filled with artists. But my hand no longer likes to hold a paint brush. Oh well, there are other things I can still enjoy. I am looking forward to your shares in the coming weeks. I have just recently changed my Tea Time Tuesday to a new party called No Place Like Home. This allows everyone to not only share tea wares but also any home related subjects including crafts and home decor, etc.. I would love to have you join me when you feel like it. Your pretty teacups and crafts would be most welcome. Take care, Terri, and I am so happy you are feeling better. Well dear Terri , I cannot tell you how often I thought of you(especially when someone on a blog would share a special teacup) and have missed you! I do hope you are well and am thrilled to hear from you again. So many lovely art projects here too! I love the idea of one large granny square for a crocheted blanket. It's been ages since I crocheted. And those saweet pups! 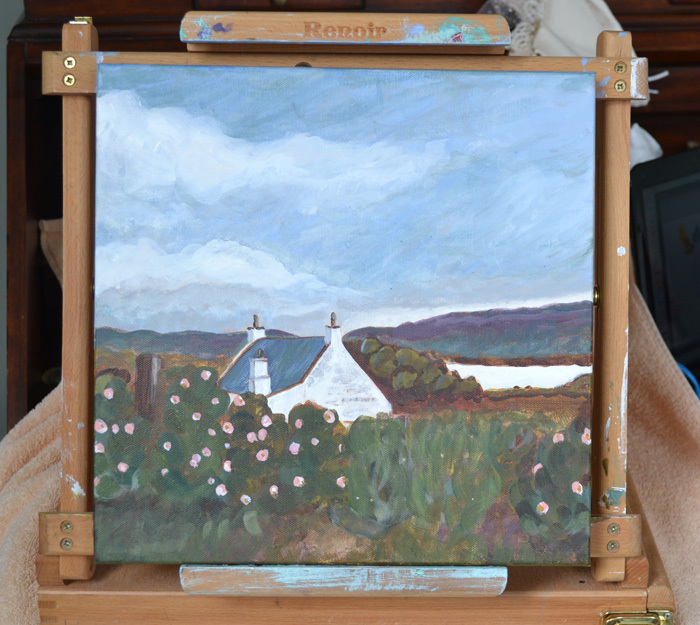 That is a beautiful landscape painting you made. And of course I adore your Christmas Village houses too. Thanks so much for popping in to my blog every now and then-much appreciated. Welcome back! I hope everything is fine with you now. I too don't post often, but now feel like I'm being pulled back, to write, post pictures and best of all - connect with my blogging buddies. I was so delighted to read this post this morning. You filled my heart with simple joy! It is so wonderful what you have achieved over these past months in spite of every challenging day! 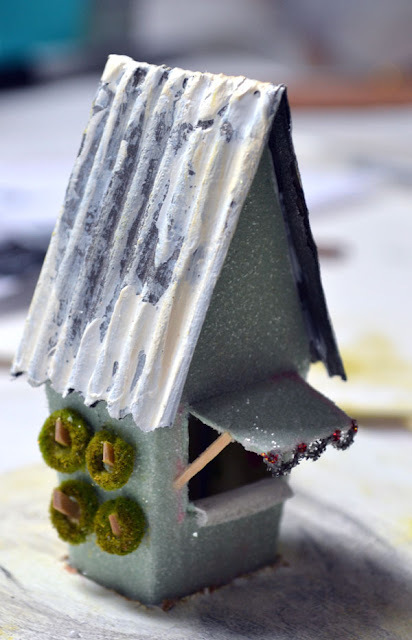 Love those Autumnal leaves, your frosted tin roof house coming together so beautifully and that amazing rug which Emma and Betsy have already claimed in your colours too! Even a painting in the making! Wow! You amaze me sweet friend. Love it all and you too! Glad you're back. Your projects are lovely and your two dogs are adorable. Dear Terri, what a wonderful surprise, I`m so happy for you, you are able to be back, and for all of us, now being able to watch all your beauty here on your blog, again. The Tag with the wonderful sentiment has such a beautiful truth ,and your throw, is a fantastic work, love the colors, and it is so beautifully crocheted !! And oh my,-your tiny houses, that little sales cabin with the wreaths,hanging outside, and with the ice twinkling, on the counter , is so adorable . You are really a master in so many kinds of art, dear friend,-and now also with your paintings, which I love. What a happy end of my day, being able to visit you here, Terri, thank you, and "see you soon "
I wish you every good thing, dear tea sister friend! Welcome "home!" HUGS!!!! Glad to see you back!! LOVING all the projects you are working on!!!!!! Terri! It's wonderful to hear from you again. I always enjoy your blogs so much. I hope this means all is well in your life. I'm glad to see that you were still able to make some of your original creations. As always, they're beautiful and inspiring. It is simply wonderful to have you back. Missed your oresence and the tea times very much. And your art is as glorious as ever! Big Welcome Back hug! Nice to see you here - love the little glittery house. Your painting is grand - something I've always wanted to do. Enjoy being back as much as we enjoy seeing you here. It's so good to hear from you, Terri!!! I hope all is well with you. I am still praying daily for you and your son. 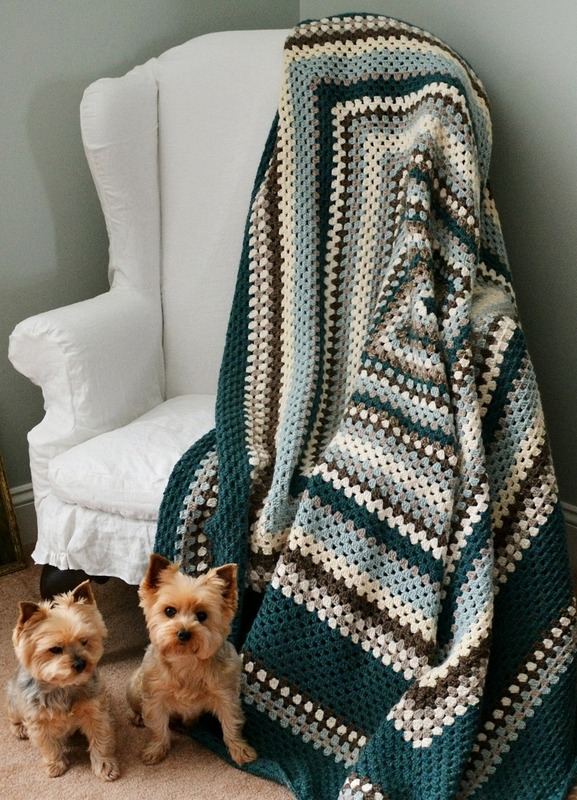 It seems like you have been busy and your crocheted blanket is so pretty. Your little hut is just darling! Welcome back, and thank you for your sweet visit to my blog. Hugs and blessings are sent to you. Terri, You have been SO missed! I hope you are going to have a much better and healthier year! Your pups are adorable and your hair looks beautiful. Love it! God bless you. A lovely surprise to see your post! So happy to see you and your wonderful creations, your blanket is beautiful...love those colors, my favorite! The houses are adorable, such tiny work!! The painting is gorgeous is Terri, you are so so talented! I am looking forward to so much more! Love you! Dearest Terri! Thank you so much for your lovely comment on my blog. I have been so swamped with "life" that I haven't had many moments to myself and so fell behind in my beloved blog and it is so wonderful not to be forgotten by sweet friends like you! I hope to be able to steal some time for myself soon and check in more often. For now I am going to allow myself the luxury of reading your recent posts and see what fabulous creations you had been adding! 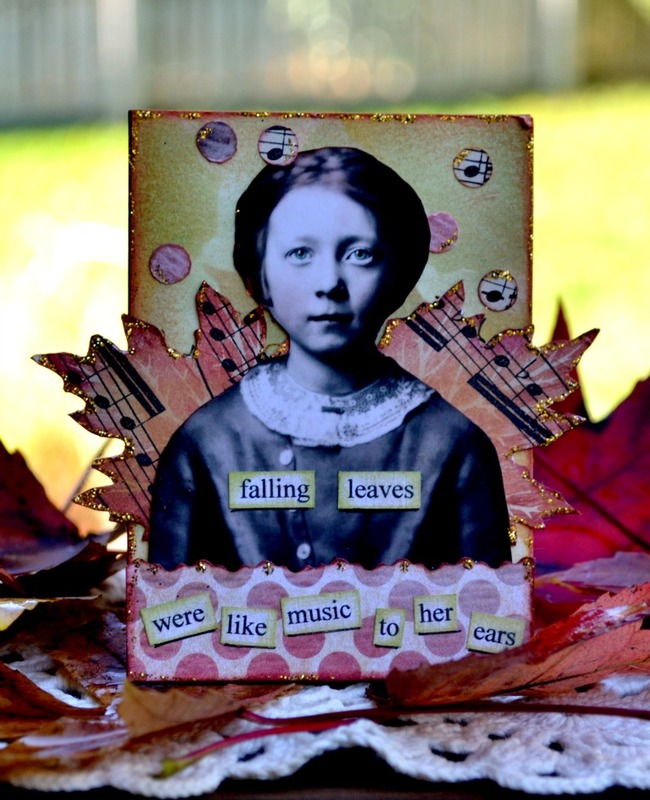 The beautiful art you posted about falling leaves being music to her ears is definitely me. Have a great day Terri! Thanks for dropping by to say hi Terri and I'm happy you are back to blogging with the support of fellow sisters. Your two little furbaby girls are so sweet and probably think you made the afghan for them. 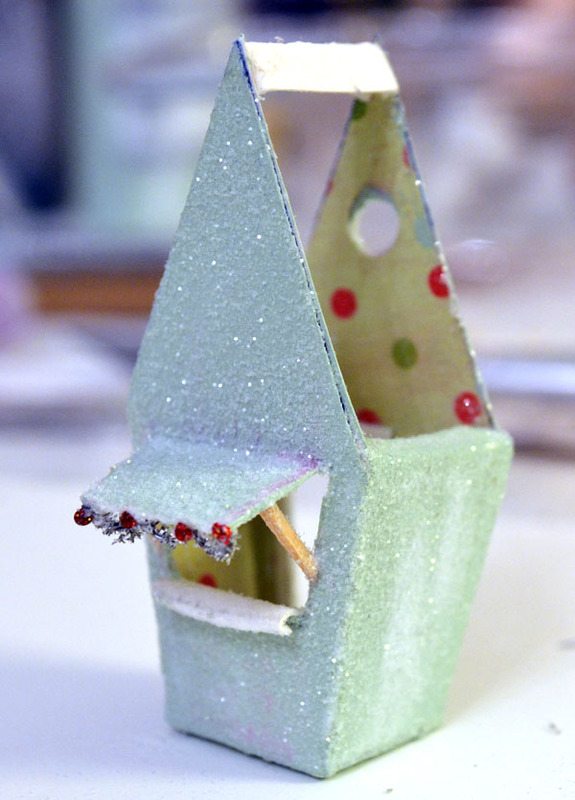 You've been busy crafting in other ways too, I adore the little glitter house. Terri I had to come by and leave another comment as I just finished watching your YouTube videos on the little Fairy School....Wow what can I say? I smiled all the way through the videos more than I have in a long time! What a treat it was to watch them and I am inspired to try it for myself soon! I can really relate to your comment about people happening by just when you need them most! I was asked recently to teach a craft in January to my church's Women's Society and was at a loss for what to teach that could be adjusted to all skill levels and ,wham, you leave me a comment and I mosey over here to say hi and that led to visiting your YouTube channel and that led me to the video on "Marie" slippers!!! Perfect! So today you are the answer to my prayers and I had to say thank you for your creativity and for your generosity in sharing those wonderful videos with everyone! As I prepare for January's class I will be thinking of you! Oh and I will get photos to share with you! I am so glad to see you posting again! I finally got around to replying to you, I am sorry I get so scattered. Just spent 3 hours doing a TMS research stroke study at U of M today. Thank-you so much for visiting me Terri , thus letting me know you're back ! I am so glad, I missed you. Your glitter house is lovely and I am thinking it would be a sweet to craft with my granddaughters showing them this little house for inspiration in making their own. It is wonderful to have you back, dear Terri. Love all of your creations.Have a wonderful week and a Happy Thanksgiving.